As long as Trudy Goodheart can remember she has been infatuated with technology, be it mechanical, electronic, or otherwise. Her father was for many years Metrobay’s resident inventor and a pioneer in the field of electronics at Metrobay University. He routinely encouraged his only daughter to follow in the family business at a time when women were not expected to get a higher education let alone enter the workforce. There were many nights when Garfield Goodheart – a devoted single father – would entertain Trudy in his workshop with tales of great inventors past, and the wide-eyed girl would eagerly soak up every word. When the time came for Trudy to choose her career path, she decided to combine the profession of her father with that of his father, a city constable, by inventing new equipment to help the police fight crime. To pursue her dream, Trudy first had to make a name for herself, and her natural smarts and skills drew the eye of APEX Industries, and Kikka Brust in particular, who wisely hired her, an oddity at the time considering almost the entire staff was male. Despite her skills, her superiors remained prejudiced, believing Kikka only wanted another female companion around, and Trudy, instead of helping create revolutionary new technology, was tasked with mundane assignments such as making the other workers coffee and running errands. While she inwardly resented being treated like a nanny, she held true to the course, believing her hard work and dedication would eventually pay off. During one such mundane assignment, APEX (and unknown to her the Circle of R.O.P.E.) assigned her to assist in a beauty pageant they were hosting, offering her services to carry bags and show potential beauty queens their rooms. It was here that Trudy ran into Kelly West, the future Ms. Metrobay, one of the pageant candidates. Shortly after this fated meeting, Trudy wandered in on her boss Kikka forcing a recently enslaved pageant contestant to pleasure herself and unknowingly revealed her fiendish plot. When Trudy was discovered, she made a break for it with Kikka, Feelix Von Ick and theirZombots in hot pursuit, warning Kelly and dragging her out of R.O.P.E. Mansion and back to her apartment on the other side of town to hide out. Unfortunately, Kikka was able to track her down and her Zombot minions abducted Kelly while Trudy was taking a bath. 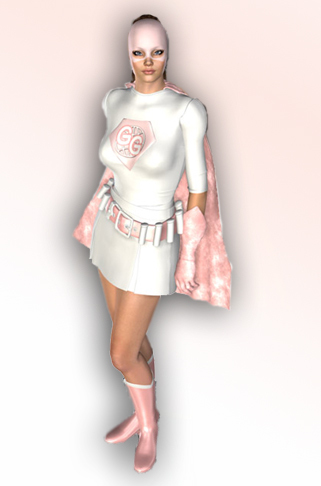 Upon discovering her friend had been kidnapped, Trudy revealed she had been crafting a costumed superhero identity, that of “Gadget Gal”, and proceeded to try and track her friend down. She found help in Grime City when she encountered the powerful vigilante Nightengale. Unfortunately, upon entering Feelix’s lair, she and Nightengale were discovered and captured by a mind controlled Valiant Woman and forced to witness Feelix carry out his experiments. Without her gadget belt, Feelix did not consider her a threat, but she staged a daring escape attempt while her friend Nightengale was being enslaved by a zombot Omega Woman. Trudy managed to reach her gadget belt and blast a high-pitched signal at her friends, disrupting their mental conditioning and freeing them from Feelix’s control. The liberated heroines then restrained Feelix and Kikka and made their escape from their lair. Trudy joined Ms. Metrobay, Omega Woman, Nightengale, Valiant Woman, and later Dare Damsel to form the original Superheroine Squad in the pursuit of peace and justice throughout their beloved hometown. A talented seamstress and inventor, Trudy provided the majority of the early squad’s costumes, gadgets, and accessories and proved to be an invaluable ally in their pursue of justice. She even took in Valiant Woman as a temporary roommate to shelter and help educate the out-of-her-element amazon in the workings of the modern world. Despite her cute and pleasant demeanor, Trudy has been shown to be a very resourceful and brave woman, willing to take action before many others. Many opponents underestimate her for her short stature and sweet disposition, a mistake she is quick to punish them for. For a long while, she nurtured a crush on her fellow teammate Ms. Metrobay, and while the two hold mutual respect and fondness for each other, Trudy was quick to come to terms that her affection was one-sided though the two remained close friends. Years later, after campaigning to the police department for sponsorship and authorization, she met, fell in love with, and married the chief of police. The chief eventually granted the Superheroine Squad full law-enforcement powers, responsibilities, and entitlements. She continued to fight the good fight along side her friends and family until her husband died, leaving her a widow. She retired shortly thereafter, but she nevertheless continued to assist the crimefighters and honor his memory by continuing to create many of the now-iconic uniforms worn by many heroines. Her expertise in crafting comfortable, visually appealing, and functional uniforms became almost legendary and many within the crimefighting community regard her as the “Betsy Ross” of costume creating. Even then-villain Dr. Twisted was familiar with her skills and recruited her services in designing uniforms for his robo-women, which she provided unaware of his sinister intentions. A retired Gadget Gal currently spends her golden years in a high-end retirement home earning a well-deserved rest alongside other aging heroes. She is good friends with many retired crimefighters such as Nightengale and Alpha Man, and continues to socialize with Ms. Metrobay on a regular basis. Alpha Woman even affectionately calls her “Aunt Trudy”, implying the former heroine had a significant impact on the younger heroine’s life as she grew up. Though she is no longer able to physically rush into battle and her eyesight isn’t as sharp as it used to be, she is more than willing to mentor younger heroines and assist from the sidelines in any way she can. Trudy never possessed genuine superpowers, but she compensated with a wide variety of gadgets and useful accessories and a swift and cunning mind. Through clever intellect, she devised and used everything from universal lockpicks to gas grenades to unbreakable rope, as well as various travel-sized weapons and practical remedies, such as anti-venom, a portable gas mask, and hi-tech infrared and x-ray glasses. Of note, almost all of her creations and gadgets were non-lethal. However, her sharp mind was her greatest weapon, often able to bail her and her teammates out of otherwise impossible situations.